Crowley Logistics | Hobson Enterprises Ltd. Located in St. Kitts-Nevis, Hobson Enterprises prides itself on being a stellar agent for Crowley Maritime Corporation in the Caribbean. In 2009, 2010, 2011 we were awarded Sales Agent of the year for Crowley Latin America and the Caribbean, which is an exploit that we are certainly proud of and continue to strive towards. 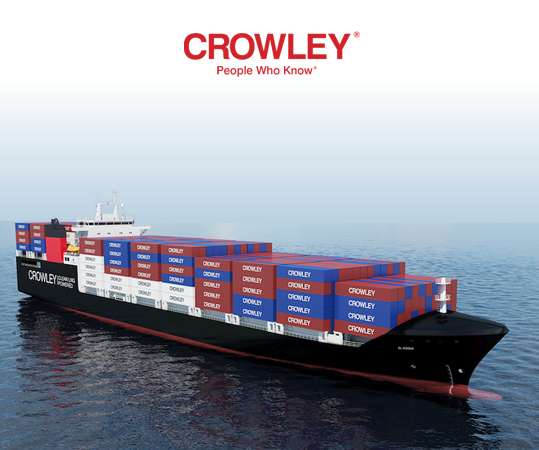 Crowley has built a strong reputation for being one the most diversified transportation companies in the world with extremely reliable and efficient operations in the Caribbean region. At Hobson Enterprises our Crowley operation functions as one of the major elements that contributes to the efficiency of our Shipping and Logistics services. Not only do we offer LCL and FCL services via Crowley, we are the only company in St. Kitts and Nevis with a reefer available to ensure items like cold and frozen goods are guaranteed ideal shipping conditions. Through our relationship with Crowley we have faced the demands presented by modern day expediency in trade and globalization head on, by utilizing the latest technology, vessels, and equipment and communication channels from the People Who Know. With Crowley liner shipping and cargo carrier services to the federation, and a host of logistics services available globally, Hobson Enterprises will continue to ensure that we serve our local and international clientele well.